For many around the world, Nightwish is a musical phenomenon. It is not a stretch for most of us to recognize that the Nightwish sound was instrumental in the development of the genre we now call the Symphonic, Operatic Gothic music scene. In fact, many would argue, with good reason, that they initiated that sound and, although it has been imitated by numerous bands around the world, it is still viewed first and foremost as the trademark Nightwish sound. The band has stayed relatively intact over the years with few personnel changes. Vocalist Tarja Turunen is, of course, the singer who brought the operatic vocal to metal. Keyboardist Tuomas Holopainen served as composer, lyricist and keyboardist working a range of high-tech devices that brought about the symphonic backgrounds. Other bandmembers (Emppu Vuorinen, guitars; Jukka Nevalainen, drums; Sami Vanska; bass 1998-2001; Marco Hietala, bass/male vocals 2002-present) have also put their mark on the Nightwish sound, but it could be logically argued that Turunen and Holopainen are the signature components for the Nightwish style. Today, of course, the original composition has been altered considerably. Tarja was dismissed from the band in October of 2005. Her replacement, Anette Olzon, brings a different vocal style to the band and arguments continue as to how much that has taken away from the "traditional" Nightwish sound. It does not seem to have hurt their popularity, however. The band has released a highly-regarded new CD, Dark Passion Play, and continues to draw well around the world in live performances. And by "around the world", we mean all around the world. Nightwish recently completed a number of highly regarded concerts in Communist China, so their work is not limited to Western Europe by any means. Today there is hardly a corner of the earth where the Nightwish sound isn’t known by some portion of the population. Female vocalists have always had a place in music. There have been several who have made an impact on the metal scene: Pat Benatar, Lita Ford, Heart and many others have had careers of various levels of success. For the most part, however, metal has traditionally been a male-dominated domain. Many argue that the female fronted metal scene, especially the gothic-oriented sub genre, originated with the 1997 release Mandylion by The Gathering, a Dutch group headed up by vocalist Anneke van Giersbergen. The Dutch led the way with a progression of similar bands with big-time female voices headed by After Forever and Within Temptation. Other bands followed using female voices either as leads or as co-leads; bands like Lacuna Coil and Tristania. This progression has continued to the point where female-fronted metal is now an expected part of much of the international metal scene. The number of female-fronted groups is beyond counting, and not only in Western Europe but also in Eastern Europe, Russia, the Middle East and parts of the Far East. Even China and Japan are producing musical groups that don’t deviate far from the Nightwish sound. In the Americas, the movement is probably more pronounced in South America than in the Northern Hemisphere. However, even in North America, American groups like Evanescence and In This Moment, or Canadian groups like Kittie, have garnered their share of support. The range of styles within the genre has expanded as well. The symphonic operatic gothic remains a predominant style, however, not all female singers utilize an operatic approach. One could argue that few singers possess the training and the skill level to accomplish this type of delivery, but it could also be attributed logically to the fact that with the expansion of the female-fronted metal scene, other styles and delivery formats were a logical development. The Nightwish sound is often tied to the Gothic Musical direction that has been a large part of the Western European Musical scene for several decades. Although Holopainen is often associated with several various styles, including fantasy and science fiction, he clearly has a message that is often tied to the Gothic theme. That theme speaks to the dark side, the ethereal, the eternal, and in Holopainen’s own words, the loss of innocence. "Where have all the feelings gone? Why is the deadliest sin – to love as I loved you? soon to be freed from care, from human pain. Time pays us but with earth & dust, and a dark, silent grave. hope is only an illusion & Ocean Soul’s nothing but a name…"
Clearly, there are others who have adopted similar themes, some in far darker terms. However, the poetry of Holopainen has carried the message in some of the most beautiful music published in the last several decades. And that involvement parallels much of the corresponding innovation associated with the Nightwish experience. It is a legacy of the band, as much as the symphonic, operatic metal sound that delivers that message. Nightwish began as an acoustic band in 1996 when vocalist Tarja Turunen was asked to join a fledgling musical group by keyboardist Tuomas Holopainen. The two were, at that time, students at Finland’s Sibelius Academy, a locale that has seen its share of musical notables in the Gothic Metal realm and elsewhere. Tarja’s early musical interests generally focused on more classical directions. None of the bandmembers really saw Nightwish as a permanent day job; the males of the band went off to the Finnish army at one time or another while Tarja continued her studies. The seven-song demo that would become their first OFFICIAL album, Angels Fall First, was picked up by Spinefarm records in Finland to be released towards the end of 1997, prompting the band’s first-ever gig in Finland on New Year’s Eve of that same year. And the rest, as they say, is history. As 1998 dawned, Nightwish became an overnight success story in their native country. To further expose their music to their rapidly-growing audience, they released their second album, Oceanborn, the first time the group actually came together and recorded an album as a real band. There were tensions in the making of the album, but its final products were Nightwish standard classics such as the album’s first single, "Sacrament of Wilderness" and the cover of the Snowman theme, "Walking in the Air". The popularity of Oceanborn would soon find its way past the borders of Finland when a song called "Sleeping Sun" was recorded and later used for the Eurovision contest in 1999 to commemorate a solar eclipse taking place that past summer in Germany. They did not win Eurovision, but "Sleeping Sun" rose high in the musical polls and helped push sales of Oceanborn outside of Finland. From that point on, the band’s popularity only continued in an upward motion, growing bigger and faster with each new album. The year 2000 saw the release of their third album, Wishmaster, which was referred to by Holopainen as "a sequel to Oceanborn", but considered by many of their fans to be their first real breakthrough album. Their sound reached outside of Europe, all the way to South America and Canada, where they would tour for the first time in support of this album. The wildly successful tour would be documented in a 2001 DVD entitled From Wishes to Eternity. To further ride the wave of success while having time to compose new material, the mini-EP Over the Hills and Far Away was released. This title featured 3 brand-new songs, one being a cover of the Gary Moore classic that gave the EP its name. Once the tour wrapped up, the band reached its first major crisis point, which almost prompted Holopainen to break up Nightwish, but instead resulted in the release of bassist Sami Vanska. Sami’s replacement was a veteran in the Finnish metal scene: Marco Hietala, bassist/vocalist of the legendary Finnish metal group Tarot, and at the time, the current bassist of fellow female-fronted Finnish metal group Sinergy. Eventually Marco would make the transition and become Nightwish’s full-time bassist and back up vocalist upon the release of the band’s highly anticipated fourth album, Century Child. Century Child was a first for Nightwish in many ways; the bombastic qualities that were hinted at on past albums could flourish completely with the inclusion of a full orchestra. The lyrics delved into highly personal matter, from what Holopainen deemed "the worst year" of his life to date. Due to illness during the recording of the album, Tarja’s operatic voice was less prominent but continued its powerful delivery, especially coupled with Hietala’s passionate, screaming vocals. The album brought them massive fame and enabled them to tour countries that many other bands in the genre had not yet visited; Korea and the United States for instance. The story of Nightwish, which was still growing every day in magnitude and scope, was put into DVD form in 2003 with the release of End of Innocence. This only heightening anticipation for what this band, who had sprung out of the Finnish wilderness only 6 years earlier, would do next. The result was the band’s fifth album, and arguably their most experimental in content, 2004’s Once, which was recently named by a British magazine to be one of the most influential albums of the decade. The work was a continuation of the Nightwish sound, with highlights like the first single, "Nemo", but in many ways it was a break from their earlier works. Using an orchestra again, the music was expanded with less traditional elements added to the music. For instance, techno sounds were included on the album’s second single, "Wish I Had an Angel", which was featured in the soundtrack to the horror film Alone in the Dark. Further proof of the album’s wide range of diversity was the daring release of their third single, "Kuolema Tekee Taiteilijan", a song completely sung in Finnish. Other songs on the album featured various soundscapes Nightwish was now incorporating into their music. Among these was the Native American-inspired "Creek Mary’s Blood", featuring Native American Lakota flutist John Two-Hawks. Some fans, however, feared this first Nightwish foray into the most taboo territory of rap-rock. Other concerns focused on the ultra-heavy "Romanticide" and the subtle Middle-Eastern influences on the fourth and final single, "The Siren". By this time Nightwish was a hot commodity; the bandmembers were releasing solo projects, and guesting on other albums or projects with prominent colleagues on the international music scene. Tarja was unquestionably the "face" as well as the voice of Nightwish; her fame became something set apart from the other band members. Everyone wanted to be seen with Tarja; whether it was the Finnish president inviting her to events, or guesting on countless projects in both the metal and classical music scenes, it was clear that she was the break-out star. Her release of a Christmas single at the end of 2004 showed that she was poised for a solo career of her own which caused apprehension among fans who worried that she would leave the band. But as the other band members continued with their own outside interests, while continuing to be full-time members of Nightwish, fans were guaranteed that Tarja could have both a solo project and a place in Nightwish. 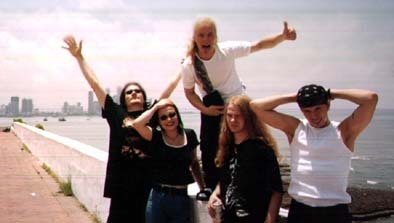 Meanwhile, the Once tour sped on full-steam ahead, taking the band to their very first tours in Japan, the United States, and Australia, and lasting nearly 2 years, ending in October 2005 as not only the end of the tour, but the end of Nightwish as the world had previously known it. The final show of the Once tour took place in Helsinki, Finland and was filmed for DVD release later in the following year. It ended with a bang onstage and a quiet exchange backstage moments later that resulted in Tarja receiving a letter, the contents of which would be made known to the world by the next day. It announced her dismissal from Nightwish and expressed the desire of the remaining bandmembers to carry on with a new singer. 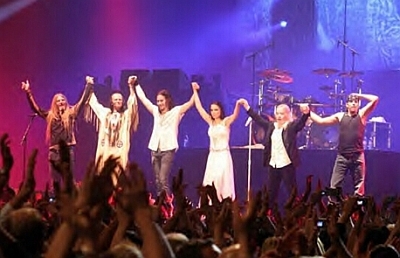 Like any other split, the now-infamous "open letter" was debated hotly by fans, both those who agreed with the viewpoint of the remaining bandmembers that it was Tarja’s sudden fame that changed her attitude and caused the rift; or those who sympathized with Tarja and were offended that after so many years with Nightwish, she could be fired in such a cold and unceremonious way. Public statements by Holopainen, as well as by Marcelo Cabuli, Tarja’s husband/manager (and accused by the Nightwish bandmembers as being a major factor in their split with Tarja) were made through magazines and over the internet, each stating their side of the story. 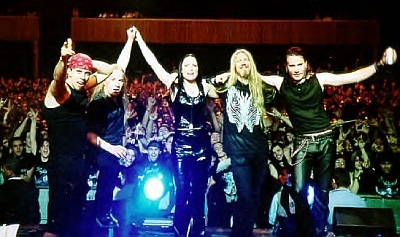 Fans would get their chance to judge for themselves when End of an Era was released in mid-2006, showing the classic Nightwish line-up onstage for the last time, as well as a documentary about the final two weeks of the tour, which showed clearly, no matter whose side one took, that there were tensions within Nightwish and that the ending that took place was no real surprise after all. Either way, the news was received as a bolt of lightning by the music community. Internet sites were ablaze and followers of the band were speechless. The public comments by both sides were followed closely by music fans and others interested in the development. Sides were chosen, however, the principle question, eventually, became, who would replace Tarja? The rumor mill went into full blast as one name after another was floated. It seemed that any female who came within a hundred-mile radius of any of the Nightwish members was rumored to be the band’s new singer. Who would be chosen, how would it affect the band, would there be a totally new direction, how would it be received? The answer was some time in coming. The year 2006 saw both parties of the Nightwish/Tarja split working hard at forging new paths of their respective careers. Tarja gave Christmas concerts at the end of 2005 and 2006, releasing a proper Christmas album at the end of 2006 while she worked on her first solo album of original material. The Nightwish members held an "open audition" for women all over the world and requested that singers send in their tapes and audition to fill the place of what was one of the most beloved and admired voices in the femme-metal scene. For their legion of fans, an official biography, Once Upon a Nightwish, was released, the book chronicling in detail the band’s career from the very beginning up to the tumultuous state it was in at that point. As the members of Nightwish continued listening to countless audition tapes, they released a song for a Finnish movie called "While Your Lips Are Still Red", featuring Hietala solely on vocals, at the beginning of 2007. The year 2007 was a breakthrough year for both Nightwish and Tarja. In May of ’07, Nightwish announced that their new singer had been found and her name was Anette Olzon, former frontwoman of the defunct Swedish band Alyson Avenue. It was quickly learned that Anette’s demo tape was among the first sent to the band, and she had been a serious contender from the beginning. Her take on the Nightwish ballad "Ever Dream" was what prompted the band to hire her. Anette is a polar opposite to Tarja both vocally and in many other ways. Where the former Nightwish frontwoman exuded an aura of mystery and reserve, Anette is approachable and charming, taking her place at the mic in funky girlish styles where the former frontwoman once wore long, flowing coats and elegantly tailored dresses. Anette has a more classic rock sensibility, no operatic tendencies whatsoever. 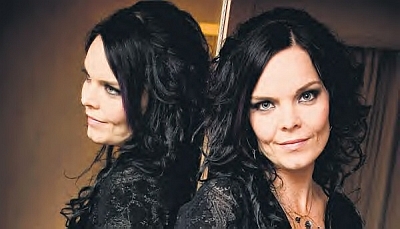 When the internet-only single, "Eva", first introduced the Nightwish audience to Anette Olzon, many wondered what direction Nightwish was now headed towards. Seemingly on the heels of the release of Dark Passion Play in the fall of ’07, Tarja was not to be outdone, and in November released her long-awaited solo album, My Winter Storm. Now that both parties had officially given the world their new sounds, comparisons between the two singers only heightened and continue to this day. And we can expect they will most likely continue for many years to come. At the time of this writing, both Nightwish and Tarja have toured extensively for their respective albums, both looking to capture not only the audience they built together, but to garner new fans as separate entities. After their respective tours, both parties are expected to start work on the production of new material. Nightwish continues to be a powerful force in contemporary music, as does the voice of Tarja Turunen. The band has seen significant success with their new singer; Tarja headlines at Female Voices and sells out concert after concert, but neither is breaking new ground in the mode of the initial Nightwish. That phenomenon has seen few parallels in the annals of popular music, especially in terms of the international recognition for their music. And, in the fragmented musical scene that has evolved in the past decade or so, it may not be a phenomenon we are likely to see again. So what is the Nightwish legacy, at least the Tarja-era legacy? How can it be described, what is its impact on the international musical scene? One has only to look at the myriad of related sounds from all corners of the globe to recognize the answer to those questions. Bands like Operatika and Evanescence from the United States, Visions of Atlantis from Austria, Seraphim from Taiwan, After Forever and Epica from Holland, Stream of Passion from Mexico/Holland, Niobeth and Ebony Ark from Spain and countless others carry forward the Nightwish sound. Still many others have tried to achieve the same success by following the Nightwish formula and have never achieved that goal, bands like the now-defunct Brazilian groups Pettalom and Venin Noir. To one degree or another, there are hundreds of bands that have ridden the coattails of Nightwish to national and international fame. The operatic sound may be hard to duplicate, but the symphonic theme has become a cornerstone for many bands around the world. In Scandinavia alone, the bands following the Nightwish formula are too numerous to name. And that, as much as anything, defines the Nightwish legacy. For those who saw the Nightwish sound as a directional change in music, the division that occurred in ’05 will always leave listeners wondering what might have been, and forever longing for more. However, we are comforted with the legacy that remains, the musical direction, the catalog of timeless songs that continue to feed our consciousness. The musical component that is attributed to Tuomas will continue, the voice that is Tarja is there for our continued enjoyment. No one knows what the future holds, is there the possibility of a reunion of this unparalleled musical troop? Or, is there another Nightwish sound out there ready to be heard? In any case, we are better for their contribution, we are better for what they have left, we are better for what they have meant for music. There are many bands throughout the world that materialize and separate every day, and among them all, they can only hope to leave a mark in musical history near the level of the Nightwish legacy. Until that time, Nightwish is the standard, the highest level of the bar, and we can only be thankful for what they have contributed to the music scene.